Mort Künstler Handsigned and Numbered Limited Edition: "Rush to the Summit "
Edition Size: Artist Signed and Numbered Limited Edition to 350 prints on paper w/ 50 Artist Proofs and 115 Canvas Editions with 25 AP's. Medium: Lithograph on Paper and Giclee on Canvas editions. Image Dimensions: Paper Image size: 16" x 30 1/2" Overall size: 21" x 34 1/2". / Select Canvas Sizes from Drop Down Box Above. About the Art: Thirty-four year-old Colonel Joshua L. Chamberlain's orders were clear and urgent: Move your regiment and do it fast. It was the second day at the Battle of Gettysburg, and General Robert E. Lee's formidable Army of Northern Virginia was making its attack. The day before, Lee's hard-fighting troops had broken the Federal line and had driven Northern troops through the town of Gettysburg in defeat and near panic. They had been stopped and reformed on a new line atop defensible high ground called Cemetery Ridge - and now Lee had struck again. This time two Confederate assaults came simultaneously; one against the right side of the Federal line, and the other against the left side. On the left, the Northern defenders began giving way, and the Southerners were on their way to capturing a strategic, undefended battlefield landmark - a high wooded hill called Little Round Top. If captured by the Confederates, it could mean destruction of the Federal line. The battle - and maybe even the war - could be lost for the Union. A frantic call was issued for Federal troops to defend the crucial hill. In response, four regiments of Northern troops were rushed to Little Round Top's summit. 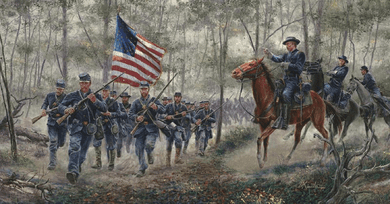 One was the 20th Maine Infantry, commanded by Joshua Chamberlain, who led his men up the rugged hillside to defend the vitally important Federal left flank. The regiment's orders were to hold their position "at all hazards;" they could not let the enemy turn the far left flank. Colonel Chamberlain was no professional soldier: He was a college professor who had left the classroom to volunteer for duty. But he was a natural leader, and at Little Round Top he proved it. His troops piled up a line of stones and fence rails, and waited for the inevitable attack. It came soon -- charge after charge by the 15th Alabama Infantry, which was one of the toughest regiments in Lee's army. Hickory-hard fighters, the Alabamians had never failed to take an objective - but this day they did. Despite a valiant effort, they were turned back by Colonel Chamberlain and the men from Maine. The decisive moment came when Chamberlain, realizing his troops were out of ammunition, ordered a desperate but successful bayonet counter-charge that saved the day. Saved too, for the Union, was the Federal army - and perhaps the war. Colonel Chamberlain and the 20th Maine had rushed to the summit, and had prevailed. Mort Kunstler's Comments Joshua Lawrence Chamberlain has always been one of my favorite characters from the Civil War. A citizen soldier who forged an extraordinary military career, he went on to a civilian life that was nothing short of spectacular: President of Bowdoin College, acclaimed classroom instructor, and four-time Governor of Maine. Like Lee, he was a man of exceptional character, and his appeal seems to be universal. Today, Chamberlain seems to have as many admirers in the South as he does in the North. Rush to the Summit presents Chamberlain at a critical moment in the battle of Gettysburg. It's a prequel to an earlier and very popular work of mine - Chamberlain's Charge - which depicts the climax of Chamberlain's famous and heroic defense of Little Round Top. Rush to the Summit shows Chamberlain on horseback before he dismounted, ordering the 20th Maine up the hill to the summit of Little Round Top. The color company, Company F, races to the top with its color guard in the lead. The red Maltese cross corps badge is prominent on the troops' kepis as well as is the regiment's number 20. The battle flag is painted from photographs of the original 20th Maine colors, which are preserved and displayed at the Maine State Museum. Armed with their Springfields and Enfields, the men from Maine are seen taking their positions on the extreme left of the Union line. The tone of the green in the woods is deliberately different from the trees in Chamberlain's Charge and another Chamberlain work of mine entitled Hero of Little Round Top. This painting is different because it occurs earlier in the afternoon, when virtually no battle smoke was there. I was able to utilize the bright sunlight filtering through the trees to dramatically light the flag and Chamberlain. His brother and military aide, Thomas Chamberlain, is the mounted officer right behind him. I can only hope that this prequel Rush to the Summit proves to be as well-received as Chamberlain's Charge. Joshua Chamberlain and the 20th Maine certainly deserve to be remembered.